The Athletics have announced that Matt Williams will take over as the team’s new third base coach. He will round out the staff of manager Bob Melvin. Oakland had an opening arise when the Nationals hired away Chip Hale, who’s now the bench coach in the nation’s capital. Williams, of course, previously served as the Nats’ manager. Now, he’s heading back to the Bay Area, where he once starred with the Giants. The 51-year-old Williams has plenty of experience waving runners to the plate. He has served as the Diamondbacks’ third base coach for two different stints, wrapped around his up-and-down tenure in D.C.
Former Nationals manager Matt Williams has accepted an offer to return to his previously occupied role as third base coach of the Diamondbacks, John Gambadoro of Arizona Sports 98.7 reported earlier today (via Twitter). The Arizona Republic’s Nick Piecoro tweets that an official announcement from the D-Backs should come on Wednesday. Williams, 49, served on the D-Backs’ coaching staff from 2010-13 before Nationals president of baseball operations Mike Rizzo (formerly a scouting director with the Diamondbacks) hired him as the team’s manager prior to the 2014 season. 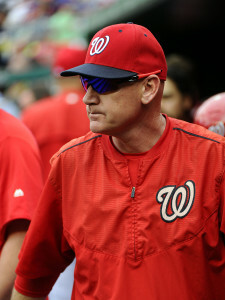 Williams joined the Nats without any previous managerial experience to speak of, and while he guided the team to an overall winning record in two seasons at the helm, his lack of experience in communicating with players reportedly weighed on the clubhouse. He was let go following a disappointing season that saw the Nationals — a popular postseason pick and the NL East Division favorite back in Spring Training — fall short of the playoffs entirely. That, of course, isn’t to say that Williams doesn’t have plenty to bring to the table as a member of a Major League coaching staff. The five-time All-Star enjoyed a 17-year Major League career during which he batted .268/.317/.489 with 378 homers, and he now has six years of coaching/managerial experience to bring to the table in a familiar environment. While Williams will serve under a different manager this time around in Arizona — Kirk Gibson has been replaced by Chip Hale — there are still some familiar faces on the coaching staff. Bench coach Glenn Sherlock has been with the team for 16 seasons, and while assistant hitting coach Mark Grace wasn’t on the Major League staff back in 2013, the two men are former D-Backs teammates (2001-03) and both have extensive careers with the organization. And, of course, players such as Paul Goldschmidt, A.J. Pollock, Patrick Corbin, Aaron Hill and Brad Ziegler, among others, were on the roster during Williams’ previous coaching stint in Phoenix. 10:45am: The Nationals announced that not only has Williams been fired, but the entire coaching staff has been let go as well. Bench coach Randy Knorr, pitching coach Steve McCatty, hitting coach Rick Schu, third base coach Bobby Henley, first base coach Tony Tarasco, bullpen coach Matt LeCroy and defensive coordinator Mark Weidemaier are all out, as the Nats will hire a new skipper and an entirely new field staff. 10:17am: The Nationals dismissed manager Matt Williams earlier this morning, a source tells James Wagner of the Washington Post (Twitter link). Jon Heyman of CBS Sports wrote last Friday that his fate was sealed, and reports of communication issues from Heyman, the Post’s Barry Svrluga and others have been circulating for quite some time. Believed by many to be the division favorite entering the season, the Nationals instead finished the year second place in the NL East by a wide margin and also failed to secure a Wild Card spot in the playoffs. Of course, injuries played a large role in the team’s underperformance — Anthony Rendon, Ryan Zimmerman, Denard Span, Jayson Werth, Stephen Strasburg and Doug Fister were among those to spend time on the DL — and an unexpectedly dreadful first half from Ian Desmond did the team little favors. However, reports late in the season surfaced that suggested Williams’ cold demeanor didn’t sit well with players, and the aforementioned Svrluga report in particular chronicles a significant altercation with Werth while also mentioning communication issues with a number of veteran players. Bryce Harper gave Williams a vote of confidence late in the season, but shortly thereafter, the manager seemed inexplicably oblivious to a physical confrontation between Harper and trade acquisition Jonathan Papelbon. Harper called Papelbon’s antics “tired” after the closer threw near Manny Machado’s head, telling the media that if anyone on the club was going to pay for it, it’d be Harper himself the following day in the form of retaliatory plunking. Days later, Papelbon would take issue with Harper, supposedly for not running out a fly-ball (though, as many have pointed out, Harper did reach first base prior to the ball being caught) and ultimately grab Harper by the throat and shove him after a heated exchange. Unaware of what had transpired at the other end of the dugout, Williams sent Papelbon out to pitch the next inning. Williams won National League Manager of the Year honors in 2014 despite persistent questions regarding his bullpen management, which were highlighted in last year’s playoffs. His two-year tenure with the Nationals will conclude with a 179-145 record that looks impressive on paper but serves as a reminder that there’s much more to evaluating a manager than simply checking the win/loss column. The Nationals have no choice but to part ways with Papelbon in the wake of this embarrassing situation, CBS Sports’ Jon Heyman opines. The team may have to end up releasing him outright and eating the $11MM owed to Papelbon for 2016 given that his trade value is at rock-bottom. As Heyman notes, “several – and I mean several – major-league GMs declared at deadline time they wouldn’t ever consider touching Papelbon” due to his reputation as a bad clubhouse personality. Matt Williams initially told reporters that the situation was just “a family issue,” though he later clarified that he didn’t see the incident when it actually happened (via tweets from James Wagner of the Washington Post) and only saw footage after his initial talk with the media. Williams stated that he’s “livid about it” and wouldn’t have allowed Papelbon to keep pitching had he initially seen what happened. As you might expect, Williams was heavily criticized for both letting Papelbon stay in the game and then criticized again for not being aware of the altercation. Williams is widely expected to be fired in the wake of the Nationals’ rough season, though Heyman reports that the Lerner family considered firing Williams weeks ago but decided to stay the course since the team was still in the pennant race. GM Mike Rizzo will return in 2016 for “one more chance,” though Heyman wonders if the Lerners could or should make a next managerial hire themselves since Rizzo hired Williams. The Papelbon/Harper skirmish “will be a symbol of an entire season when everything went wrong and every hidden structural weakness in the franchise was exposed,” Thomas Boswell of the Washington Post writes. Rather than write off 2015 to injuries and Williams’ managerial tactics, Boswell argues that the Nationals should take the opportunity to examine factors like “organizational culture” to payroll flexibility to even Ted Lerner’s tendency to negotiate free agent contracts directly with agent Scott Boras. Danny Espinosa has a slight tear in his hamstring and will require four weeks to recover from the injury, Nationals manager Matt Williams told reporters, including CSN Washington’s Mark Zuckerman (Twitter link). As such, his 2015 season is over. Despite the disappointing results of his team, Espinosa can call it a year knowing that he did quite a bit to restore his stock as a valuable Major Leaguer in what was an excellent rebound campaign. Espinosa’s production at the plate — a .240/.311/.409 batting line — wasn’t stellar, but it came in just a bit below league average, which, when paired with his excellent glovework at second base, made him worth about two wins above replacement. It’s a dramatic turnaround from the combined .200/.255/.326 that he batted from 2013-14 and should be enough that the Nationals wouldn’t even consider non-tendering him — a concept that would’ve seemed plausible entering the season. Doug Fister sat down with MLB.com’s Bill Ladson to discuss his move to the bullpen and his upcoming free agency. Fister explained that while he was disappointed with the relatively short leash he was given in the rotation, he took the move to the bullpen with a positive attitude and is happy to have proved to himself that he can be a successful bullpen piece if ever needed. However, Fister said that his goal is to return to a rotation eventually, whether it’s with the Nationals or another team. Fister has a 2.25 ERA with a 15-to-5 K/BB ratio in 16 innings out of the bullpen. Rosenthal suggests that Bryce Harper’s recent praise for manager Matt Williams could be a genuine expression of support that could help dissuade the Nationals from firing Williams, or it could be a “politically savvy” move to bolster his own reputation as a team player by offering praise for a manager he thinks will eventually be fired anyway. The downside of Giancarlo Stanton’s long-term deal was that he committed to be with a questionably run Marlins organization for at least six years. Rosenthal notes, though, that 2015 hasn’t been the first season in which Stanton has struggled to stay healthy — he has only averaged 118 games played per season for his career. In signing a long-term deal, Stanton reduced the risk that injuries could limit his career earnings. The Cubs have plenty of talented infielders and could still trade Starlin Castro, who has improved his stock by hitting well since the beginning of August and capably handling a new position, second base. Now, the Cubs can market him either as a shortstop or as a second baseman. Jeff Samardzija hasn’t pitched well for the White Sox, but his health record is pristine, with one executive says the health of his right arm is “right out of the womb.” The Yankees or Pirates could be good fits for Samardzija, Rosenthal suggests, given their recent successes at helping struggling but talented pitchers. Samardzija might do surprisingly well on the market this winter, Rosenthal says.